A quintessential British tart, what could be better for Bake Off?! One of the recipes I wrote for The Sun newspaper this week. – Place the flour, butter, sugar and salt into the bowl of a food processor with a metal blade. Whizz using the pulse button until it looks like breadcrumbs. Add the egg, whizz briefly, then add the water 1 tbsp at a time, until the dough comes together to form a ball. – Turn the mix out onto the worksurface, work the mix quickly to form a ball, wrap in clingfilm and chill for at least 30 minutes. – Roll the chilled pastry to the thickness of a 50p piece, between 2 sheets of baking parchment, big enough to fit your flan tin. Remove the top sheet of parchment, flip the pastry and gently place into the tin. Use the baking parchment to help to ease the pastry into the fluted edges and fill with baking beans. Place in the fridge to chill for another 30 minutes. – Preheat the oven to fan 180ºC/350ºF/gas mark 4. – Bake in a preheated oven for 20 minutes, remove the parchment and beans, and return to the oven for 5 minutes more. Keep the oven on and turn it down to fan 140ºC/320ºF/gas mark 3. Remove from the oven and allow to cool completely. Carefully trim the edges of the pastry case with a sharp knife so it’s flush with the tin. – For the filling, bring the cream to the boil. Whisk the egg yolks and sugar together then add the boiled cream and mix well. Pass the mixture through a fine sieve into a large jug. – Place the flan tin with the blind-baked pastry case onto a solid baking sheet, in the oven and carefully pour in the custard. 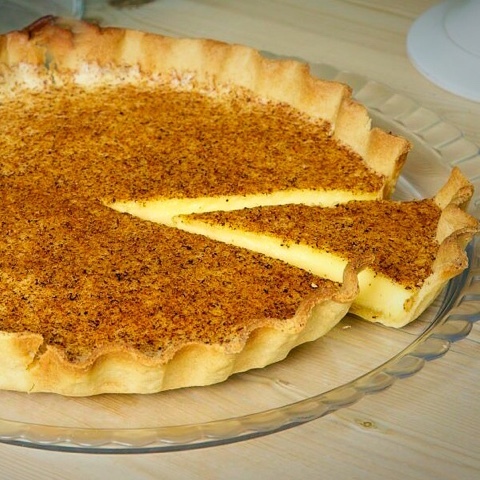 Finely grate the nutmeg liberally over the surface of the tart (about 3/4 should be enough, depending on the size of your nutmeg and how strong you like it). – Bake in the preheated oven for 35-45 minutes until the centre looks firm but still has a slight wobble. Leave to cool completely at room temperature before serving. If you don’t have baking beans, uncooked rice works just as well. And, once the rice is cooled it can be used again – just keep it in a sealed jar in the cupboard.